Wedding hairstyles are the only thing that women scare a lot. Does it match with the gown? Does it look good on the face? And so on. This is always the main problem that drains a lot of energy. At the same time, we want something from the trend but looks timeless on the photograph. Luckily, there are many cute hairstyles you can use on the wedding day, including chic up-dos, cute bobs, tousled waves and so on. All of them are good and perfect, but does it match to your accessories and gown? Hence, you will need some advice to help you find the best for your wedding day. There are many kinds of aspects to look at as you talk about the wedding dress. You have to pick accessories, considering the hair length, your gown, and your face as well. 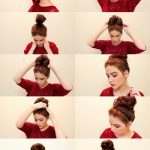 Many hairstyles will take a look at these factors which is a bit confusing if you style your hair by yourself or ask some help from relatives. So, we think our pictures collections about wedding hairstyles can help you find the best look. They are all simple to do and always look timeless in your wedding frame. Check our best collections! Best Colored Wedding Hairstyles You Have to Try! Colored wedding hairstyles are the best thing you should try today! It changes your look dramatically with less effort.Even, the shades bring another level of glamour. It even can level up your appearance so catch people attention at the entrance. Now, colored hairstyles for wedding days are a thing. If you are not into bold colors, simply you just need some improvisations with subtle highlights or ombre. Making updos, cute bobs or braided styles will look much better and fresh. 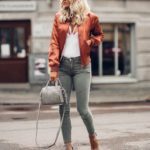 The following styles are the best one for you to try as we have a search around the best models that look timeless on your photograph. Updo hairstyle is a perfect hairstyle solution for short, medium or long hair. 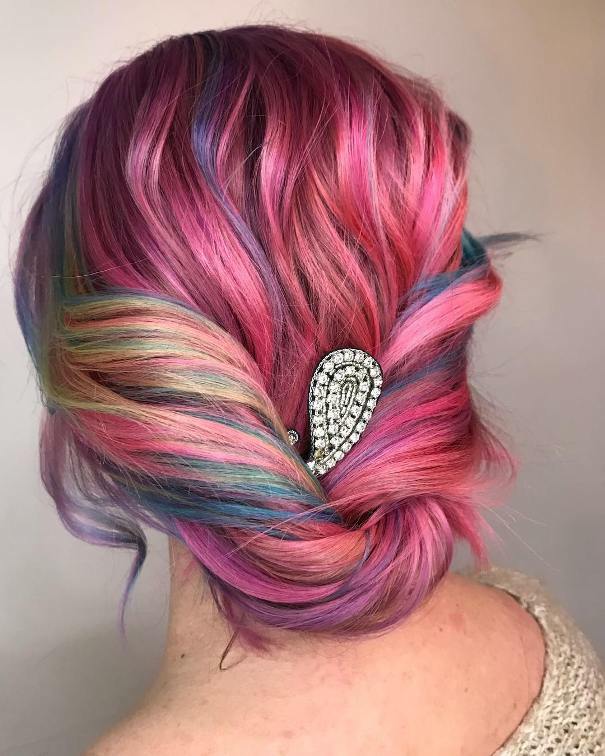 This casual updo works well for your wedding day with the beautiful color combination of Pink, purple, blue and some yellow highlights. Put a glamorous hair piece to lock your hair.